Rosmarus drawing from the imagination of Olaus Magnus. Magnus, in the 16th century, published a book about Scandinavian and Swedish history and mythology. When it came to his conversations about the walrus, one can only assume that he was spinning a tale from some regional myth. He created a number of versions of this creature, each with its own scientific-sounding name. This one was simply called rosmarus; which is part of the scientific name for an Atlantic walrus – Odobenus rosmarus. Like all of Magnus’ walruses, this one has four legs and feet with toes and claws. This fellow has a split goldfish-like tail that’s on the small side. And, he has a row of scalloped armor down his back. He looks quite fierce with spines under his chin, around his cheeks and part-way down his back. If that doesn’t scare away the wayward seaman, the teeth and large protruding tusks should. 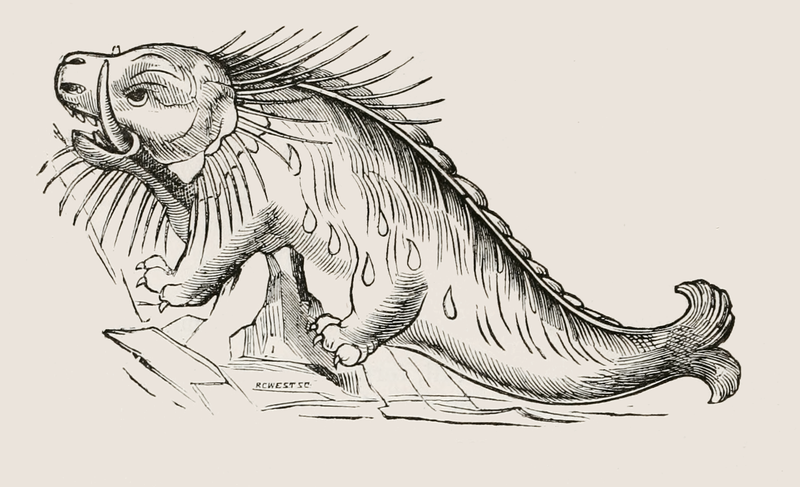 This rosmarus drawing comes from the History of North American pinnipeds: a monograph of the walruses, sea-lions, sea-bears and seals of North America which was published in 1880 and written by Allen, J. A. (Joel Asaph), 1838-1921. However, the original design dates back to 1555. We have a larger version of this rosmarus drawing. Simply click on the sea monster above to access it.